Launched in Porto Venere, the Azimut Summer Wave will touch on some of the Mediterranean’s most enchanting destinations before docking at Palma de Mallorca on August 5 for the world preview of the Azimut S7, the latest addition to the Azimut Yachts S Collection, reserved for a highly select group of owners who will enjoy the privilege of going on board ahead of the Cannes Boat Show. A rich programmed of events will enliven the beaches and marinas of Bodrum, Mykonos, Mallorca, Ibiza and Formentera, with all the ingredients for a perfect, unforgettable summer and a single common denominator: a passion for the sea and the latest generation Made in Italy lifestyle La Dolce Vita 3.0. With a backdrop of crystalline waters and cocktail parties rivaling the spectacle of summer sunsets, the Azimut fleet will ferry its guests around the most beautiful bays in the Mediterranean. The Azimut Summer Wave got underway in Porto Venere on July 7 with the Azimut Rendez-V Marine, an exclusive event organized by V Marine (official Azimut Yachts dealer), which drew over 200 guests and a fleet of 25 Azimut brand boats to the Ligurian resort. The inauguration of the Azimut Summer Wave featured some unique experiences, including a visit to the Comsubin naval base at Le Grazie (open to the public for the first time) and a gala dinner orchestrated by star chef Carlo Cracco. The harbor front was turned into an exclusive outdoor salon, with exquisite creations by Damiani Gioielli and Venini and tailored suits by Isaia and F.lli Tallia di Delfino ushering guests into an atmosphere of laid back luxury and Made in Italy beauty. Next stop Bodrum, where Italian style and Mediterranean flavors mingled in the light of turquoise waters: for the delight of Azimut guests and owners, there was an exclusive dinner at Assaggio, the Italian restaurant in the Mandarin Oriental Hotel. The Azimut Summer Wave will reach the Greek coastline on the weekend of July 28, at Mykonos, where the legendary gourmet restaurant Remezzo will be organizing an exclusive dinner event. Music and cocktails will then open the new Azimut Lounge, which will be animating Kalo Livadi beach, one of the most beautiful on the island, for the whole summer. Centre stage, of course, will be Azimut’s boats, all on display and available for visits by appointment. Next on the calendar, the Balearic Islands for the grand finale and world preview of the new Azimut S7, which will take the Summer Wave to Palma de Mallorca and Ibiza through the crystalline waters of Formentera. Select owners will be able to test drive the Azimut S7 and go on board the Azimut 77S and 55S. With music, cocktails and spectacular acrobatics by athlete Lindsay McQueen, Azimut will be animating the bays and evenings in the these pearls of the Mediterranean and sharing the Made in Italy lifestyle of a brand representing luxury, style and innovation: La Dolce Vita 3.0. Partnering Azimut are three icons of the international glamour: Audemars Piguet, Ferrari Trento and Technogym. Held on the weekend of July 7, 8 and 9 in the magnificent setting provided by Porto Venere near La Spezia, this was the third event organised by V Marine, Azimut Yachts’ exclusive dealer for northern and central Italy. 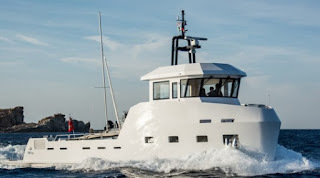 For Vincenzo Soria, Owner and Founder of V Marine with Valerio Tesei, Rendez-V represents an opportunity to share the pleasure of the sea with customers and enthusiasts. “Our intention,” he explains, “is no longer exclusively that of selling a specific product. What we want to do is offer our customers a new motoryacht-related entertainment experience. We are committed to welcoming them in an exclusive atmosphere with a unique family feeling, one that enthusiastically brings together the Customers and friends of the V Marine Owners Club. The people who contact V Marine join an exclusive club, one that unites lovers of yachting, sophisticated luxury and fun”. In an exclusive arrangement, guests were given the chance to visit the Comsubin Military Base, which is usually out of bounds for civilians, to learn about the points of excellence of one of the Italian Navy’s most storied Units. The day was brought to a close by an entertaining barbecue “captained” by Chef Carlo Cracco. At the event, joining the 25 sporty, sophisticated Azimut Yachts models, were the latest tenders in the Pirelli collection and all the thrill of the Seabob range. The nautical sector was also represented by stalwarts Volvo Penta and Raymarine. Guests were welcomed in a series of elegant spaces, including the port promenade, which was transformed by the sophisticated, edgy furnishings provided by Talenti into a luxurious outdoor reception area, embellished with decorations by Fendi Casa, while Swiss International Air Lines fitted out an entire lounge to welcome guests. Completing the experience were presentations of creations by Damiano Gioielli and Venini, with the elegant jewels by Rocca, in addition to Acqua dell’Elba fragrances, fabrics Made in Italy by APR, and carbon fiber masterpieces by Teknomonster. Finally, Isaia and F.lli Tallia di Delfino worked together to offer Rendez-V Marine guests exclusive made to measure suits. V Marine also took advantage of the event to present the recent partnerships signed with Italian community catering leader Elior and with S.Pellegrino, which created a special bottle dedicated to the event exclusively for V Marine. This is a privilege so far reserved for brands and personalities of the calibre of Missoni, Vogue, Bulgari and Pavarotti. Numerous entertainment opportunities were organised throughout the weekend, including dinner on Saturday evening prepared by Starchef Carlo Cracco, followed by a DJ set by “Nick the Nightfly” from Radio Montecarlo. Finally, Collina dei Ciliegi and Pommery Champagne organised a tasting of their products for guests, to raise a toast together to the success of the third Rendez-V Marine. Beneteau and their dealers are always on the lookout for new ways to enjoy boating, so in spring 2017, they launched the Beneteau Boat Club, taking inspiration from clubs in the United States. The first single brand club in France, this new service means that, without owning them, boaters can now enjoy Beneteau’s latest motorboat models. This is a great step towards hassle-free “on demand” boating for anyone with a boat licence. Designed for anyone wishing to take the model of their choice out to sea, whenever they like, Beneteau Boat Club guarantees its members the unique expertise and friendly approach of Beneteau’s professional network. By offering a fleet of 60 motorboats across 15 bases in France and Spain, as of this year, the Beneteau Boat Club is now the biggest European boat club. This service may be extended the Italian and British coasts. The aim is to offer a service that will enable anyone to find the boat to suit their sailing programme, with the same level of service wherever they go. When you join the Beneteau Boat Club, you have unrestricted access to a fleet of outstanding quality! 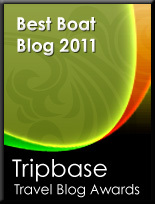 To enjoy this new boating freedom, all you need to do is pay a membership fee of 1,000 euros. Once a member, you will be able to enjoy à la carte boating on a credit system, by booking the boat you would like at the site you have chosen. Then all you need to do is be on site the day of the handover and enjoy the new freedom. This approach to boating is cheaper for its users than standard chartering. In addition to unrestricted boating, Beneteau Boat Club is an ideal way to try out a new model with a view to a future buy and it is also a way of sharing your passion. All through the year, members are invited to exclusive events such as theme nights, the first showing of Beneteau’s new models, boat shows, and boating rendezvous. “I really love your new Beneteau! You do? Which one? ” This type of interaction could become commonplace on the quays in the months to come. Whether you feel like racing or cruising, or whether you choose a day getaway or a week’s cruise, there is always a model to suit your project. The fleet available offers recent boats (less than three years old) and is meticulously maintained. Before the keys are handed over, each boat is prepared by member of our professional network on the chosen site. This person will provide boaters with information and advice on the area of navigation and weather, as well as personalized assistance when handing over the chosen model. Ferretti Group America and Allied Marine’s annual Rendez-Vous was held on Saturday, July 15th, at Navy Beach Restaurant in Montauk, New York. The event attracted about 20 yachts from the Ferretti Yachts, Riva, Pershing, Mochi Craft and Custom Line plus many Allied Marine clients. Upon arrival by the sea, all the guests were picked up by dedicated tenders and brought ashore where they were greeted with a selection of champagne and wines curated by Louis Roederer; The best in Hamptons style cuisine from Navy Beach Restaurant. Music from DJ Adam brought people to their feet as they mingled and shopped new designs offered by Sag Harbor’s own Stella Flame Jewelry. “As our family of owners across Ferretti Yachts, Riva, Pershing, Mochi Craft and Custom Line continues to grow, it is truly amazing that so many joined us for this annual event. Lots of them say they are already planning to attend next year. And we’re looking forward to hosting them once again on board our upcoming Italian nautical jewels”, stated Stefano de Vivo, Ferretti Group Chief Commercial Officer. The Ferretti Group is strengthening further its already important presence in continental Europe thanks to an exclusive partnership agreement with Yacht Consult B.V. for the markets of Belgium, the Netherlands and Luxembourg. The agreement provides for the exclusive sales and distribution rights for three years, until August 2020, for Ferretti Yachts, Riva and Pershing yacht brands. The choice to partner with Yacht Consult B.V. is part of the ongoing sales plan development, which also includes significant investments, that Ferretti Group is implementing globally. With this new dealership, the Group is expanding even further its network of selected distributors made up of over 60 dealers spread across Europe, the Middle East and Africa, and the Americas and the Asia-Pacific region, providing a service of absolute excellence in over 80 countries around the world. By relying on a highly professional partner like Yacht Consult B.V., the Ferretti Group is boosting its distribution channel in one of the most economically important areas on the Continent, Benelux. The decision aims to cater to the ever growing interest shown by a large number of yacht owners and enthusiasts in the wide-ranging fleet of open, coupé and flybridge yachts made under the Ferretti Yachts, Riva and Pershing brands. “The agreement with Yacht Consult B.V is a new, important partnership in major markets for our Group as well as being crucially important for our strategy of further growth in central and northern Europe,” stated Stefano de Vivo, Chief Commercial Officer of the Ferretti Group. “We have chosen Yacht Consult B.V. as our partner for their considerable experience, know-how and reliability in the luxury goods sector. 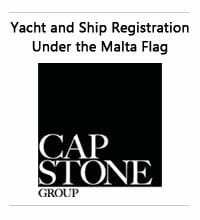 We are certain that this partnership will increase our market share in continental Europe, an area that has always been strongly attracted to the style, elegance and exclusive design of our brands, the standard bearers of Italian yachting.” The A-Star Group holding is 50% owner of Yacht Consult and owned by Ben Van Loo. He is a successful entrepreneur who has been active in the Real Estate business and leisure industry. Yacht Consult has its headquarters in Mechelen and representative offices in Oostende and Loosdrecht (NL). 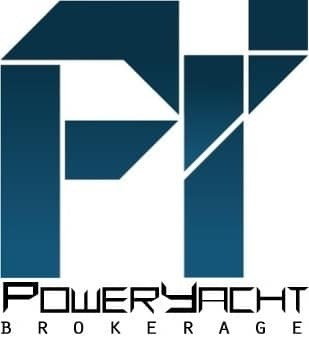 Yacht Consult will officially present the exclusive dealership agreement with Ferretti Group next October at the company Zoute Events, organizer of the Zoute Grand Prix which takes place in the wonderful city of Knokke (Le Zoute) on the Belgian seacoast. The meeting will be attended by Stefano de Vivo himself, as representative of the Ferretti Group, and Mr. Manu Deceuninck of Yacht Consult B.V.
On a beautiful and sunny day in June, Horizon Group celebrated its 30th anniversary alongside one the company’s major milestones: the Horizon City Marina. Featuring four main entertaining areas – Horizon Plaza, Horizon Wonderland, the Yacht Experience, and the Waterfront Party – the festivities provided a little bit of everything from a food court, amusement rides, and games to a live concert to end the night. Over 3,300 guests, including employees, their families and friends, and business partners, attended this unforgettable event to celebrate Horizon’s 30 years of success. The opening ceremony took place at the Horizon Plaza, where guests counted down to zero with Horizon Group CEO John Lu; when zero was reached, the yachts in the marina blew their horns into the southern Taiwan sky and officially opened the celebration. Guests were then guided by a famous aerobic trainer to undertake the group effort of forming the number 30, and the image was recorded and projected onto the main stage screen by a drone so everyone could see the fun. Strolling to the Horizon Wonderland, guests were treated to an amusement park experience for all ages to enjoy! Thirteen attractions, such as a merry-go-round, kid robots, a surfing machine and more provided plenty of fun and laughter. Additionally, a specialized pool allowed parents and children to experience popular water sports such as kayaking and SUP. At Horizon City Marina, employees’ families and friends were offered the experience of touring five luxury yachts – the RP110, FD85, E62, E56 and E56XO – and getting a feel for the yachting lifestyle. This was a special event for the family and friends of Horizon employees, as it gave them the chance to see first-hand the finished product that comes from all the hard work of their loved ones! As evening approached, music flowed from the Waterfront Party, hinting at the excitement to come. The lights went out and the screen played Horizon’s 30th anniversary video, which documents the company’s journey and history over the past three decades. After thanking all the employees for their dedication, Horizon CEO John Lu, the chairman, James Cheng, and the managers raised their glasses and asked all the guests to share in a toast to the past, present and future for Horizon. The evening swiftly moved into the highly anticipated concert events, where artists and bands, including the highly popular Taiwanese band Wu-Bai & China Blue, took turns rocking the night. Many guests enjoyed the music from on board a yacht, while others took to the grass to dance to their favorite songs. As the concert came to end, the crowd yelled “encore” and even the yachts joined in, blowing their horns to encourage a final tune. An unforgettable time spent in the company and friends, family and coworkers, the Horizon 30th anniversary was a true expression of joy, pride and gratitude - not only for everything the company has accomplished together but also what we will continue achieve. Here’s to the next 30 years! After a year marked by intense investment, and buoyed by full order books, Princess Yachts Limited today reports a marked turnaround from previous years. 2015 saw an operating loss (before exceptional costs) of £18.1m on turnover of £201.2m, and now in 2016 the loss has more than halved to £7.0m on turnover of £216.7m, indicating a strong positive turnaround. Having endured a challenging trading environment  in common with other luxury yacht makers  Princess began 2016 by developing an aggressive business strategy and initiating restructuring of its operations at its facilities in Plymouth. These important steps have both delivered business efficiencies and safeguarded employment for more than 2,350 people. In parallel, the launch of 4 new highly successful models has set the stage for a three-year £55m investment programme which will significantly broaden and strengthen the Princess model range. Following record sales at the Cannes, Düsseldorf and Ft. Lauderdale boat shows, orders across the range now exceed an extraordinary £0.5 billion at retail prices. The current year will see a new model launched, on average, every two months, taking Princess into new markets and opportunities. 2016 was the first full year at the helm for the company's Executive Chairman, Antony Sheriff. Previously CEO of McLaren Automotive, Mr Sheriff came to Princess with a strong track record in leading profitable businesses with best-in-class luxury products. Antony Sheriff said: "We are encouraged to see a positive and rapid turnaround. Over the course of 2016 our order book has increased by over 60% from already strong levels, driven by a 25% increase in retail sales rate which has outstripped production. In 2017, these indicators have continued to improve, which is the clearest signal of the strength of our brand and the enthusiasm with which our customers have embraced our new yachts. "Moving forward, with strong shareholder support, we are convinced that our ambitious strategy to aggressively invest in both our new products and our workforce at our historic Plymouth facilities, has already brought significant benefits to the business, with more to come as 2017 is shaping up to be a year that drives us to the next level." Ekka Yachts, exclusive dealer for Ferretti Yachts, Riva Pershing, Itama, and Mochi Craft brands in Greece, celebrated together with Ferretti Group the opening of the Riva Private Deck, at the illustrious Nammos Mykonos, at Psarou Beach, in the heart of the Mediterranean. In an unprecedented collaboration, Ekka Yachts and Ferretti Group have created an elite hub for yacht and superyacht Owners in the Aegean Sea. The Riva Private Deck, an exclusive destination space located within Nammos Beach’s newly-launched ‘’Cabana Concept’’ features an office space, a resident team, lounge and bar, all located just a stone’s throw from the Nammos dock, and perfectly sheltered from the Meltemi: undoubtedly one of the world yachting scene’s most desired destinations. On Saturday, June 24th, Ekka Yachts and Ferretti Group hosted the official inauguration of the Riva Private Deck by welcoming over 200 invitees from all over the world to its new premises for a truly special evening. 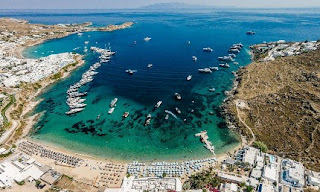 More than 20 yachts from all the Mediterranean representing the Ferretti Yachts, Pershing, Riva and Custom Line brands were moored in front of the beach, enhancing with their unique beauty the breath-taking sunset of Mykonos. With customised cocktails, exquisite canapés and a specially assembled oyster bar on the beach, guests had the chance to enjoy Nammos’ renowned culinary excellence and impeccable service whilst admiring the crystal waters and arriving yachts. From the beginning of the 2017 summer season until the end of October, Ekka’s dedicated resident team at the Riva Private Deck is available to offer clients a wide variety of services, including sales of new and used yachts, official Riva Boutique accessories, jet tenders and water-toys, technical support, and proposals on its crewed charter motor-yachts. Visitors of the Riva Private Deck will have the chance to enjoy the true Mykonos experience, either through the adjoining exclusive cabanas with private outdoor jacuzzi, or by dining at the world-renowned “Nammos Restaurant by the Sea”. It was a wild week in the Gulf. A fleet of 63 of sportfishing's top battlewagons headed out last Thursday from The Wharf in Orange Beach, Alabama, all with their eye on the prize. The Viking 68 Breathe Easy, last year's Gulf Coast Triple Crown Champion, finished in 2nd Place Overall, without weighing a billfish. Captain Patrick Ivie, owner Matt McDonald and the team scored four blue marlin releases, along with a 143.4-pound yellowfin tuna, to earn a six-figure check. Another previous Triple Crown Champion, Done Deal (left), finished second in releases with three blues to its credit, thanks to the performance of the Top Lady Angler, Katie Gonsoulin, daughter of owner Jon Gonsoulin. Captain Jason Buck runs this Viking 70. Quick Time (right), a Viking 70 run by Captain Shelby Johnson, was the 3rd Place Release Team. Jason Benton, owner of Don't Blink, a Viking 56 run by Captain Skip McAllister, was the top rod in the tuna division with a 173.6-pound yellow fin. Other boats earning tuna payouts include the Viking 70 Aldente, Viking 58 Rising Sons and Viking 76 Team Supreme. Hosted by South Jersey Tournaments and South Jersey Yacht Sales at the beautiful Canyon Club Resort, the inaugural Offshore Showdown was a roaring success despite Mother Nature being a bit temperamental. The teams fished two days and made great use of the pool party barbecue lay day. The Viking 61 Reelin Feelin held center stage under the big top at the awards dinner. The boat claimed Most Points Overall, 2nd Place White Marlin Points and 3rd Place Tuna Points. Reelin Feelin angler Mike Hudson took Most Points White Marlin while Sean Singley weighed in the heaviest tuna with a 63-pound fish. Most Points Tuna and 3rd Place Overall Points went to the Viking 70 Krazy Salt's. Polarizer, a Viking 55, finished 2nd Place Tuna Points. Columbus presents the new Berlinetta three model range of custom super yachts which starts from 33 and goes up to fifty meters. Designed by Marco Casali, the Italian builder and designer offer voluminous interiors spread on three decks, and a robust sea keeping ability thanks to a full displacement hull shape. The 33M Berlinetta is to be build of steel and an alloy super structure. Interior layout offers an owners stateroom on the forward part of the main deck, with four other guest cabins on the lower deck. 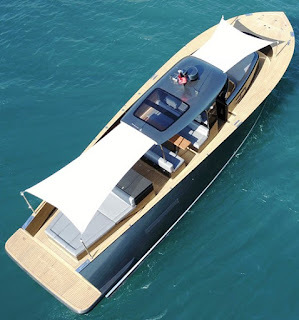 The 33M Berlinetta is offered with two stern layout options that for a tender garage or a gym platform. Power will come from twin Man 740hp engines which are estimated to give top speeds up to 13 knots and a cruise of 12. 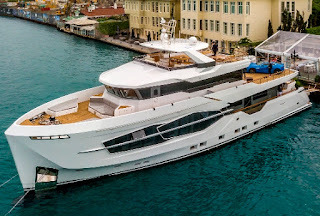 Cantiere delle Marche is on a spiral of success which has seen the Italian builder make a strong hold on the explorer style super yacht segment from 24 to forty meters in size. 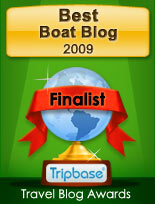 Prove of this success is the launch of hull number three of the 102 Darwin series. The first unit of Darwin 102 was splashed in the end of 2016, with two other launches following it, and a fourth and fifth currently in construction. The CdM 102 Darwin is a replacement to the 96 model of the same series and is a custom project fully build of steel. For example in hull number three the Italian super yacht builder has increased headroom, while the sundeck has been split into a fitness and lounge area. Dalla Pieta is currently active in presenting projects to clients and here is the design for a custom and sporty 82 Fly super yacht project based on the popular 80 HT series. The Dalla Pieta 82 Fly project is to say the least versatile offer offering two flybridge design options which also change the exterior looks and the size of the fly deck from thirteen to fifteen square meters. Another optional detail of the Dalla Pieta 82 Fly will be the choice of port lights from the traditional layout as pictured above, to the large opening more modern variations. The Dalla Pieta 82 Fly will offer a three or four guest cabins layout. Some project details not shown in renderings are also being studied; as the option for a fore deck settee, and a redesign of the stern area with the bathing platform opening to a beach design. Power will come from twin MTU 2200hp which will give max speeds up to 36 knots. Kadey-Krogen updates one of its popular models the 44 and now presents it into the new AE Advanced Ergonomics series. The 44 AE updated the previous 44 in galley and flybridge layout. But in total the 44 AE offers offer fifty changes. The 44 AE offers two options for the main deck this concerning the saloon area of the main deck, with an option of having two sofas or a bench style settee to port side. Below the standard layout offers a master foreship cabin, shower head to port side and office style room. 26 units where sold of the standard 44, and here Kadey-Krogen updated this model to add more successes. Regal's all-new 42 series is proving an interesting offer in the twelve meter size. The 42 Grande Coupe version follows the layout of the 42 Fly with the hard top opening replacing the flybridge and its extra entertainment area up top. Just as the Fly the 42 Grande Coupe offers a lower deck dedicated to two spacious cabins, and an option for a second guest head or a small kitchenette below. 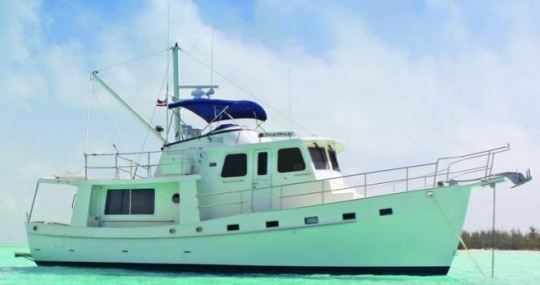 Living in the 42 Grande Coupe is all located on the main deck, with the cabin area offering a C-shaped dinette, galley and entertainment unit to starboard, and the helm station. All this becomes a special single level entertainment area with the aft deck when patio doors are fully open. Galeon presents the project for the 640 Fly, what the Polish builder says will be a game changer, once again offering solutions never before seen in this class and size of yacht. That means the Galeon will again pursue the transformer revolution as presented on the 500, and on this size will see an even more innovative approach to layout. The 640 Fly transformation adds volume and an interesting space distribution, especially in the area where the opening balconies open up in the entry part of the yachts interior. The layout of the 640 Fly features an astern galley on the main deck, while below it offers three large suites, all offering full beam size. To aft is two person crew cabin. Power for the Galeon 640 Fly comes from twin Volvo 900hp and go up to Man's 1200hp engines. Delaware's custom Sportfish Yacht builder F&S Boatworks presents a new virtual Internet showroom. Jim Floyd founded F&S around the late eighties, building hull number one a 58 foot Sportfish Yacht which today is called Triple-Net. But the founding pillars of F&S Boatworks are earlier to this, when Jim entered the woodwork trade in his early twenties, and later on founded his own construction company practicing as master carpenter and cabinet maker. United with an outdoor passion, Jim hunts and fishes most of the East Coast on a 23 foot Seacraft, which leads him to Carolina in the late seventies where the first custom builders shops start refining and pioneering the works for cold molded construction. Studying these builders and experimenting with resins and hull shapes Jim launches his first boat, which was built in the unlikely location of Middletown chicken house. The first F&S featured what have become trademark touches of the models coming from Delaware; having Carolina lines with bow flair and shear line included, and a variable deadrise hull. F&S are built in cold molding glass fibre with resin over wood in jig method, and feature a unique variable deadrise, longitudinal stepped Vee hull. This gives benefits as stability at roll, track ability in following waters, and soft head sea entry. F&S has so far delivered 26 boats from 1988 till today, although there was a twelve year break period till the second built went in the water. The smallest of the constructions has been a 36 feet Express with outboards hull 21 delivered in 2012, and the largest is the 2012 delivered hull 21 at 75 feet. Today F&S is managed by Jim Floyd, wife Maria, children Tim and Christina all in the business, with Joe Bonvetti and a select group of craftsman building each Sportfish Yacht to owner specifications. Currently F&S has three constructions in progress one of which is a new flagship of 78 feet hull number 27. F&S new website takes you around with the following buttons: Home, About, Our Models, Video, Client Login, and Contact. F&S is also on social media platforms Facebook, Twitter, and Instagram with links on the bottom of the page. 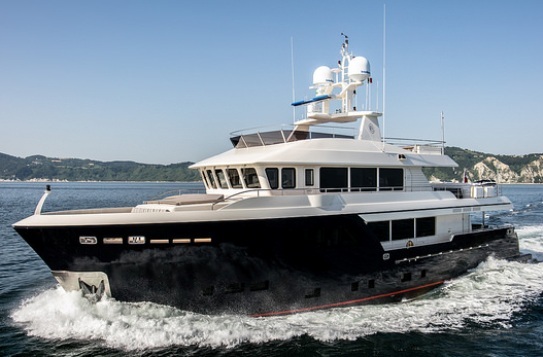 Viking is finalizing preparation for its largest build to date, and in early June 2017 launched the first unit of its 93 MY model. Hull one of the Viking 93 MY is finished in walnut hardwoods and veneers. The Viking 93 MY will offer a five double guest cabins layout with owners stateroom at midships also featuring a separate entrance. Two crew cabins sleeping three or four persons including a small lobby is located at midships. Power will come from twin MTU 1945hp engines or alternative similar Cat horsepower units. Estimated top speed is a max of 27 knots with these engines. World presentation for the 93 MY is on schedule for the Fort Lauderdale boat show 2017 in early November. Intended for a European shipowner, the Mondomarine M40 Explorer carries a wide range of interesting stylistic and functional elements representing an evolution in the Explorer yacht concept. Design by Sergio Cutolo of Hydro-Tec M40 Explorer presents smooth and intriguing lines to satisfy the most demanding eyes without compromising key features. Mondomarine M40 Explorer still maintains the main characteristics of an exploration vessel must grant: a high bow, vertical bridge windows, generous living spaces on deck and generous storerooms to haul suitable auxiliary means to explore remote places. 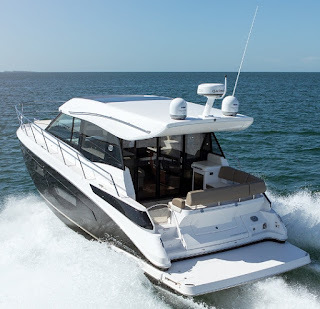 On top of these features M40’s structural strength ensures maximum safety even in very demanding conditions and its engines are appropriately sized to fit long range cruising. The construction of the M40 Explorer coincides with important milestones for both the companies involved: Mondomarine is celebrating one hundred years of unstopped activity in Savona whereas Hydro-Tec has just successfully achieved 20 years in this business. The new Sealine C530 is a coupe fully enclosed hard top version of the F530 launched in early 2016. The C530 was presented in Janaury 2017 at the Dusseldorf boat show, and gets all the features of the sister minus for the flybridge. Here in the C530 you get two hard tops, one which opens for half the saloon, adding more natural light to the main deck which is among the most glazed offers in the category. Another opening hard top is featured on the extended part covering the aft deck area. The C530 offers a three double cabins two head lower deck layout, with an owners cabin to midships. Owners have a choice to have the third cabin ordered with twin single beds or a double french style berth. To aft is a single berth crew cabin which can also be optioned as a free space room. Power for the Sealine C530 comes from twin Volvo 435hp and go up to optional 550hp and 600hp engines. Propulsion for all choices is for IPS pod drives. The Cranchi 78 Magnifica shows the Italian yard recent resolve in challenging again the bigger sizes of the yacht spectrum. Cranchi saw with the Sixty 6 Flybridge produced from 2010 to 2015 its biggest build to date, this new 78 Magnifica outlines a believe in future success for the Italian builder and the need to push the range into bigger dimensions. As usual for Cranchi, the Italian company is prepared to make important steps ahead with significant investment in research, development and infrastructure. Christian Grande design studio is presently at work on this project, collaborating with the Cranchi yard and it’s primary partners. Not much information about Cranchi 78 Magnifica is available as yet, though from the above rendering one can deduct that it has a lot of the recent style amenities and seems to show a pod drive propulsion system. A perfect blend of utility, seaworthiness and style with an interior designed by Franck Darnet, Lynx yachts XYT 20 was conceived to support super yachts and sailing yachts of any length. Like all Lynx yachts, she is first and foremost built to go to sea. For the YXT 20 the major features and functions are: deck space for larger tenders and more toys, sail boats, waver runners and more, a large beach club, guest plus crew accommodation. and additional laundry dry and cold storage capacity. Lynx YXT 20 is also designed to go close to shore in shallow water. The first unit launched clearly reveals the line’s key features with a spacious 45 square meter deck gives plenty of room for tenders and toys. The davit at the stern means the beach club can also carry tenders and jet skis. Setting the tone in true yachting style, the stairs and the first four metres of deck are teak. As the most compact of the YXT the 20 offers accommodation for four in her crew quarters with two twin cabins with baths, galley, stowage and laundry rooms. An additional segregated stowage compartment is on the lower deck for extra refrigeration or wine storage, if necessary this area can be build to spec as a cabin with additional extra berths. The guest area and lounge is finished in a rich natural wood veneer with parquet flooring. Furnishings expand on this theme. 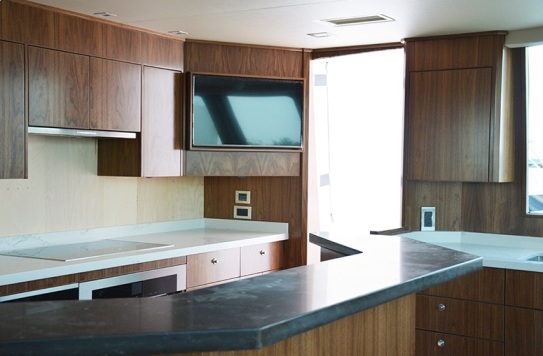 The same feeling of natural wood with furnishings in white laminate and wood trim provide a warm home away from home for her crew. Power for the Lynx YXT 20 is from twin Cummins 715hp Cummins diesels giving her a cruising speed of 14 knots and a range of 900 nautical miles. Estensi present the project for a new 380 America model set to be World launched in the upcoming 2017 Cannes boat show. The Estensi 380 America is based on the Mauro Zuccheri designed hull lines of the 360 Goldstar, with looks and upper structure inspired by East coast USA sport fisherman cruiser and designed by Marino Alfano. Still to be fair to the genre, the Estensi is not a sport-fishing machine although the exterior looks are inspired to this, the features in the cockpit are not. For example the cockpit deck of the 360 America will be a flat floor, with a bench settee to port side, while to starboard we have a dinette with a mezzanine style settee looking aft. Interior wise the Estensi 380 America will be offered in two versions a more cabin layout with two cabins and one head ideal for a family cruise, and a more open layout set for short stays and or day trips. The Estensi 380 America will be powered by standard twin Volvo 300hp and or optional 370hp. An outboard version is also set to be available. Dellapasqua presents its new World wide web virtual showroom. Starting up in 1956 Giancarlo Dellapasqua gets an apprenticeship with Lugaresi Naval Shipyard in Rimini where in three years he gets the title and licence of master craftsman with the ability to build boats up to 150 tons. Feeling confident of his title in 1959 Dellapasqua founds his boat building premises first in Savignano on Rubicone, and later on in 1970 moving to the today establishment of Marina di Ravenna. The first year of the Dellapasqua DC brand is successful with the deliveries of seventeen boats. The first boats of DC are flat bottomed hulls, but hearing of the success of the deep Vee Hunt shape, Dellapasqua decides to renew his designs with the new trend, put some personal modifications and use it from there onward for all his boats. This intuition puts Dellapasqua competing in important races in Italy of the time so that his name gets more established, and with the help of this creates the first DC4 and DC5 models. Following the operation of new premises in 1971 Dellapasqua produces its first fiberglass boat with the DC6. With this comes the fiberglass laboratory in Punta Marina of 35.000 squared meters, and a personal office in Lavagna. In 1990 Giancarlo Dellapasqua buys the other half of brand rights from Carnevali for the DC brand, this now means a full family operation. Giancarlo son Mirco graduates in the Nautical Institute of Trieste becoming responsible for fiberglass, Patrizia takes care of administration, and younger Serenella who joined in 1991 is handed over the technical department. Another important figure in the yard is Stefano Salvadori husband to Marinella who responds to the suppliers for the building of the Dellapasqua boats. Today at close to sixty years in operation Dellapasqua has delivered over 1300 boats most of which to order with a great input from the owner. The current Dellapasqua line up features fifteen models and starts with the DC7 Elite, up to the DC18 SL flagship. The new Dellapasqua website is available in Italian and English language and takes you around with the following buttons: Boat Yard, Fleet, Used, Charter, Service, Concept Design, and Contacts. With five units already sold ahead of its presentation, the new Ferretti Custom Line 33 Navetta has taken to the water at Group's Superyacht Yard in Ancona on 26 June. The 33 Navetta follows on the new generation design as outlined again by Zuccon and follows on from the Navetta 37. The Navetta 33 is the second model in the new series to hit the water and the third project in the new generation of Custom Line yachts, joining an unrivaled fleet of semi-displacement super yachts. The 33 Navetta will be specially presented to dedicated Ferretti Group clients in a super exclusive event titled Midsummer Dream, in the setting of Ibiza on 29 and 30 July and will see the unveiling of the yacht in the exclusive Lio venue, one of the most glamorous clubs in the international nightlife scene, leased for a private event for the first time, the famous Ibiza Marina and the magnificent Experimental Beach, with its unmistakable Balearic charm. The new Navetta 33 is yet another product of the joint efforts of the Product Strategy Committee of the Ferretti Group, headed by Mr. Piero Ferrari, along with Studio Zuccon International Project for the exterior design and the Group's Engineering Department for the interior design. The Navetta 33 introduces some major innovations to Custom Line's semi-displacement super yachts of this size, added to the distinctive features that have already proved so popular on Navetta 37. The hull with bulbous bow delivers performance at the top of its class in terms of seaworthiness and stability with a range of 2000 nautical miles possible at economic cruising speed The 33 Navetta also offers fabulous spaces to owners and their guests across all four decks: from the wide-body master suite forward on the main deck, through to the four guest cabins on the lower deck. Thanks to the external panoramic terrace on the starboard main deck, and the fabulous sliding windows on the aft upper deck, the lounge areas and interior and exterior dining areas are spacious and bright. By contrast, the sun deck with swimming pool and large sun pad is designed to provide moments of total privacy. The Navetta 33 features all the technical innovations that characterize all Custom Line's latest models: the patented DMT system for optimal use of the stern area; VOTIS software to provide the most flexible and practical on-board infotainment systems; and an integrated helm station for safe monitoring of the systems and equipment on board while under way. Moreover, the first Navetta 33 is equipped with a top of the range Hi-Fi system. Additional features include a special flexible joint in the transmission lines, which absorbs shaft vibrations, and other cutting-edge solutions that reduce noise levels to a minimum. The floating floor beneath the parquet flooring, for example, helps reduce the transmission of noise to the living areas by softening any footfall. Further comfort and safety solutions when mooring and at anchor include the electro-hydraulic stabilizing fins and on request added with Seakeeper stabilizers. There are three engine options available for the Ferretti Custom Line 33 Navetta: Man 1400hp and or 1600hp, and Cats 1622hp. 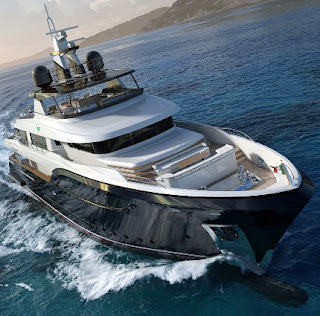 Gagliotta present the project for a 48 Lobster, a continuation of the Lobster 35, this series from the Italian Neapolitan builder is all about following tradition. The exterior of the Lobster 48 is a traditional Down East boat inspired lines. But tradition inspiration does not stop from the basic three double cabins layout; forward owners cabin and two double cabins at midships, and last to the always loved line shaft propulsion system. Apart the plans Gagliotta is pretty silent on details for the Lobster 48 as engine choices, and performance numbers. The 35 was designed by the Germans Judel and Vrolijk famous for there Americas Cup success with Alinghi, but here we have no designer mentioned. The Gagliotta 48 Lobster started production planning at the end of Winter 2017, and the Neapolitan builder is also preparing project plans for a Lobster 42 model. When Azimut releases a project in around the seventeen to eighteen meter size everyone enters into attention lets see what they got mode. Let's be frank the Italian known by everyone Azimut and its designers have been a game changer in this size both in the early nineties with the revolutionary AZ54; first to have a midships owners stateroom in this size, and then again at the start of the new millennium when it launched the ground breaking 55 with its how did they do it midships full beam owners cabin. 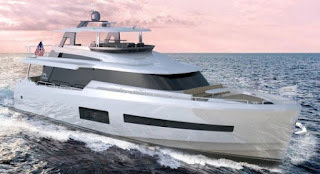 This new 60 project is the next step of what the 55 represented in the Genoa boat show year 2000, and which after that sold in five hundred units plus in its eight years production run. The 55 was followed by the 58 launched in 2007 and then developed into the current 60 as presented in the fall of 2011. The 60 just as was the 58/60 before it, is an evolution to the series, being the next step the revolutionary 55 represented. 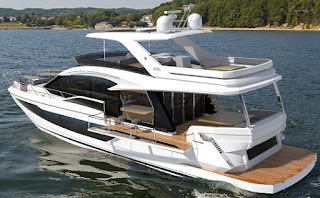 By the renderings of this new 60 we see that designer Righini is bringing details from recent other Azimut Flybridge models see new 50 and 66 models type windows, and the Alfa Romeo inspired bow of the S series. Inside Azimut does not follow trends and sticks to its beliefs; see central galley instead of the astern location so much favored nowadays by the other famous names in this size. Below deck is the main difference between the old and new 60, as the new Azimut offers a three cabins three head layout, with a third day guest head to port of the stair case which takes from the saloon to the cabins. I always thought this detail had to come in the 58 back in 2007 especially when thinking that the Azimut 55 first full beam midships cabin challenger the Aicon 56 offered the third head back when launched in 2002. The Azimut 60 will be powered by the Man 800hp engines of which a top speed of 32 knots is being estimated. Technical numbers are lightly different to the current 60 meaning that probably the Azimut technical department might have started with a blank paper. An interesting detail also present in the new 60 data is the 2.9 tons less of displacement versus the outgoing model. Couach present the project for a new 37-metre 3700 Sport super yacht. This new project is a reimagined 37-metre superyacht, and replaces one of the company’s longstanding popular models, with six custom-built vessels having been delivered of the 3700 Yacht model. Upholding the admired sporty and seaworthy DNA of its predecessor’s design and indeed the overarching design philosophy of all Couach custom yachts a new energy has been injected into the latest 3700 Sport through a lengthening of its lines and strengthening of its profile. The 3700 Sport takes design cues from the world of luxury automobiles as well as contemporary architecture and naval design. It is available in a four or five-cabin arrangement, complemented by ample glazing to amplify the interior’s natural light. The large main saloon, incorporating lounging and dining areas, offers a fantastic feeling of space for a sport yacht, with accommodation for up to ten guests tended to by six crew. The released renderings of the 3700 Sport’s interiors suggest an ethnic and light design theme, with a neutral palette of wood finishes, hand-crafted details and luxurious materials; these can be tailored to any buyer’s tastes. The Couach design team focused on creating a yacht that offers a chic yet cozy ambiance for owner and guests. Suspended ceilings enhance the feeling of height in cabins, while the outstanding attention to detail will result in a refined yacht worthy of the highly respected Couach name. The exterior offers a range of areas from which to soak up the ever-changing surroundings. As an addition from the earlier Couach 3700 Fly, sun pads have been added to the fore-deck to provide a new, private space for relaxation. The expansive duplex aft deck features a “bathing beach” fitted out with a shower, umbrella, diving board and swim ladder, just steps away from the multi-purpose cockpit with sun loungers and dining area. Space in the yacht’s tender garage allows for a five-meter tender for adventures ashore, as well as a jet-ski for fun on water. The flybridge is, of course, one of the main areas for enjoyment for many yacht owners, and the 3700 Sport will not disappoint. having imagined a space similar to a contemporary beachfront villa, with expansive, panoramic views and all amenities easily at hand. There is an outdoor kitchen and grill, with areas for relaxing, dining and sunbathing, meaning it will no doubt be a hive of activity for anyone on-board. An ultra-modern Jacuzzi could be added to the flybridge layout, which is fully custom to a buyer’s personal preferences. Paying tribute to Couach’s military ship building legacy, as with all Couach Yachts, the 3700 Sport maintains superb seaworthiness and capabilities in even the toughest conditions, as well as an impressive top speed of 28 knots and 24 at cruise followed by exceptional maneuverability. The hull would be constructed in fiberglass for which Couach is best known, while her draft of 1.85 meters means she can venture into secluded shallow bays. Gyroscopic stabilizers ensure a calm and peaceful experience when at anchor or underway. The new 3700 Sport model’s release follows a year of updates and evolution at Couach, including new in-house management and design appointments, collaborations with world-class yacht designers and a raft of newly developed models. Numarine, the Turkish motor and super yacht builder from Istanbul with a range from 62 to 105, is pleased to announce the launch of the hull #1 of the new 32XP Series, sold in June 2016. The private ceremony has been held in Istanbul in front of her owner, an experienced and loyal Numarine client. The all-new Numarine 32XP offers incredible volumes of internal living spaces on board, with her steel hull construction and GRP superstructure allowing the yard and her owner to create unique layouts internally and customized external spaces, both of which have been penned by Can Yalman, the renowned design partner of Numarine responsible for all of the shipyard’s distinctive model lines. Numarine 32XP has a displacement of just under 300 GT, the maximum limit of the category, confirming the superior volumes of this vessel. Like in all Numarine's, the interiors of the 32XP have been fully customized so to reflect the owner’s preferences in terms of layout, design, fabrics and materials. The main deck offers a generous cockpit that also provides for a comfortable stern sun pad area right behind the couch seating, for a total of 64 square meters of living space. An expansive salon of 48 square meters leads to a lobby area with a day head and a separate gym on the starboard side, and then to a full-beam forward master cabin with more than 30 square meters of space and separate his and hers bathrooms sharing a very generous central shower. Center-ship on the portside, a fully functional kitchen with four full-height refrigerators links to the salon via a pantry area and to the crew quarters below, connected to the external port side passage with a crew-dedicated entrance, all to allow the highest standard of service on board and maximum guest privacy. Below deck, the layout offers 2 VIP Cabins mid-ship and 2 double cabins, all with ensuite bathrooms, and over 85 square meters of living space. Below deck forward, the five person crew quarters provide ideal spaces for the captain with his private cabin and ensuite, and four crew members in two doubles with ensuite. A crew kitchen with dinette area and a laundry room complete the crew area. On the upper deck, a truly phenomenal owner’s cabin with over forty square meters of living space including a large walk-in closet and generous owner’s bathroom opens up via sliding doors to the incredibly large upper deck; this deck can fit in navigation a nine meter RIB tender and two jet-skis with the help of the 2,5 Tons crane. Forward of the wheelhouse, in the Numarine tradition one can find a large couch area with bimini and cocktail table and two extensive sunpad areas. Total external space on the upper deck is fantastic 129 square meters. Finally, the flybridge offers sixty square meters of entertainment space customized to include in the first unit three couches, a twelve persons dining table, two large sun-pad areas a fully-fitted bar, three navigation seats and a central secondary helm station. Regarding performance, the new Numarine 32XP, exploiting the yard's engineering capabilities together with its long-standing partner naval architect Umberto Tagliavini, has a very efficient displacement hull that will give the Numarine 32XP a top speed of fourteen knots, a cruise speed of twelve knots, and a confidence inspiring 3000 Nm range at an economical speed of nine knots. In designing the 32XP, Numarine paid considerable attention, with the assistance of its longstanding partner Silent Line, to elimination and reduction of all noise and vibration sources, with the goal of surpassing RINA “Comfort Class” Certification and achieving comfort levels of fifty meters in a 32 meters superyacht. Van den Hoven Jachtbouw in the Netherlands has received orders from two clients for its brand-new Executive 1500 Mk.2 project. The stylish design by John van Leeuwen is fully in line with the recognizable language seen on the spacious and elegant Executive 1850, introduced earlier this year. Buoyed by these first two orders, Van den Hoven is also building a third Executive 1500 Mk.2 on spec and expects to attract a new client in the near future. Build of steel the Van der Hoven 1500 Executive Mk.2 is semi-custom offer, and choices to buyers including an option for a flybridge and single or twin engines set ups. Cheoy Lee expand its Bravo line with a new 72 entry level model. Designed by Howard Apollonio naval architect and exterior lines, and Sylvia Bolton responsible for the interior the new 72 Bravo is a conservative looker. The interior of this new Cheoy Lee 72 Bravo also presents itself on the conservative side with the standard for this size four double cabins layout; owners at midships, VIP forward, twin to port side, and twin bunk to starboard layout plan. The main deck of the 72 Bravo offers a full living space with an open galley, and a central helm station. Flybridge is fully reserved for entertainment with tender storage staying aft on the bathing platform. Power comes from twin Volvo 800hp units with IPS pod propulsion.